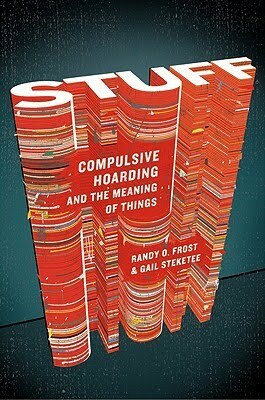 In Stuff: Compulsive Hoarding and the Meaning of Things, author and researcher Randy Frost takes a look at a growing phenomenon across America: hoarding. He investigates this issue not by going straight at it point by point, but rather does it more effectively by telling stories. True stories. Harrowing stories but some hopeful stories. Regardless of, I found that each story had this tinge of sadness to it. The book opens up with the story of the famous Collyer Brothers. The Collyers were two wealthy but reclusive brothers who lived together closer to the beginning of the 20th century. Langley Collyer who was handicapped by a number of sicknesses and disabilities (including blindness) was taken care of by his brother Homer. They were agoraphobic, hardly leaving their compound and taking refuge in the comfort of their home located in upper Manhattan. They feared burglars who in the past would break in hoping to steal all sorts of wealth but found nothing but junk. After incidents like this, they boarded up all the windows in fear that it would happen again. They hoarded all sorts of junk in their home, to the point where piles and piles of stuff would reach the ceiling — literally and not figuratively. Because they hardly left their house, the police would often receive phone calls from neighbours claiming that the brothers had died. On one such occasion, a police officer responding to the call tried to get into the house after no one answered the door. He tried to get in through the front door but there was something obstructing it from the other side. After other police officials came, they tried getting in through the boarded up ground floor windows but to no avail as well. They finally broke into the house through the second story windows and even then, there was difficulty. 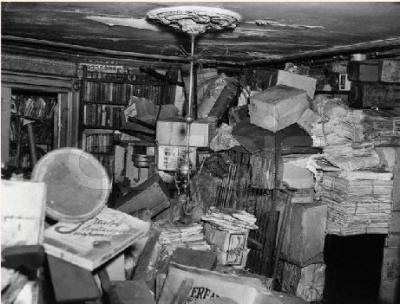 They found heaps and heaps of newspapers piled to the ceiling and had difficulty navigating the house. Because of this, it made it difficult to locate the brothers. They found the body of Homer which was determined to be only 10 hours dead. But still they could not find the body of Langley. It was a week later, when they found the decaying body of Langley, only 10 feet away from where Homer's corpse had lain. Because there were so many high and thick piles of newspapers and other possessions, police could not find the body until so many days later. They found that Langley had died first, crushed by the heaps of newspapers in the room. Unable to care for himself, Homer died in his bed from malnutrition and thirst days later. A photo of the Collyer's home. By the time the police fully cleared the home, they found over 130 tonnes of garbage in the house. The house clearing drew crowds every day as it was such a spectacle. Anyhow, I know that wasn't a review, but the story struck me hard and I would be remiss if I didn't share it. Needless to say, I enjoyed the book. And that's just one such story. All the other stories in the book are firsthand accounts by people that Frost and his team encountered with. As I mentioned before, there's often a tinge of sadness to each story, with people going through such hardships in their family all because of hoarding and their failure to see a problem. Few stories are hopeful where the candidates accept that they need to change and do so, while others are more unfortunate, with the hoarders turning down any form of help. The book did make me think about a lot of things in my life as well. I'm not a hoarder to the degree that these folks were/are but in some ways I am still a hoarder. My room is filled with all sorts of junk. Even under my computer desk is a box of clothes that I haven't worn in years, but that I one day intend to. I told myself that four years ago, yet the box is still here unopened. My hoarding even manifests itself in video game form, although not necessarily in the form of hoarding video games. In any RPGs, often times I find it difficult selling my goods for cash, preferring to keep the unused (useless) items in my inventory. Even when it comes to using any sorts of potions and consumable goods, I refrain from doing so if I can use magic instead which usually replenishes itself. By end game, I've got stacks and stacks of unused items. My hoarding in geek form. The book is an easy recommend and it's available in hardcover at your local bookstore. Peace out geeks! a) you totally do that. LOL, it's true though. Why waste potions that are worth money than use a magical spell equivalent that can be replenished. I'm just trying to be smart (not really).